Today’s Trading Room looks at Copper, US Oil and GBPUSD. To learn what the Trading Room is about see first Trading Room analysis here. Trading Room will focus on classic technical analysis. 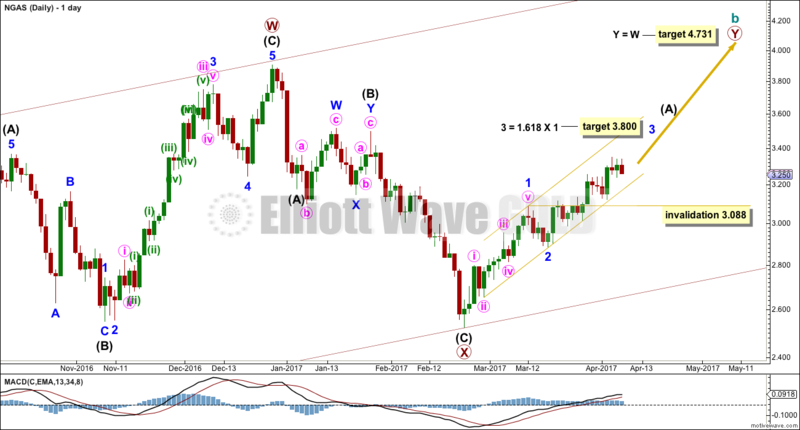 Elliott wave analysis will be for support and for targets / invalidation points. Members were advised to enter short on the 10th of April. Stops were initially set just above 2.700 and are now moved down to breakeven to eliminate risk. 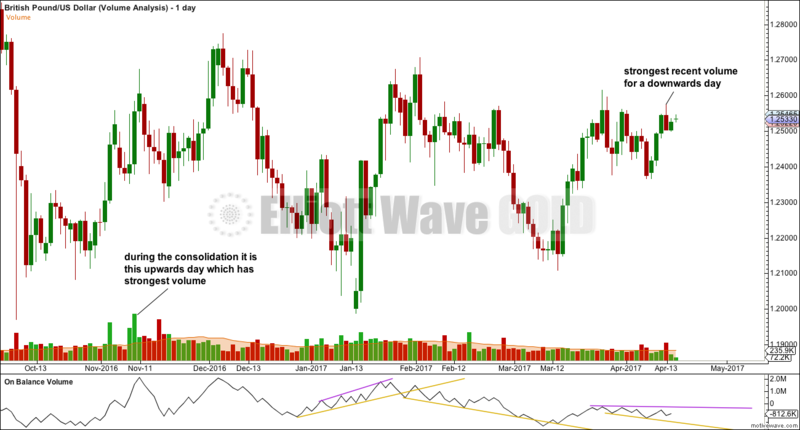 On the 12th of April Copper had a classic downwards breakout from a consolidation zone, supported by volume. Now price is turning up to test resistance at prior support, about 2.590. The downwards session for the 12th of April has strong volume. The last upwards session for the 13th of April has lighter volume. Volume is bearish. The long upper wick on the candlestick for the 13th of April is bearish. On Balance Volume is bearish. RSI is not extreme, so there is plenty of room for price to fall. 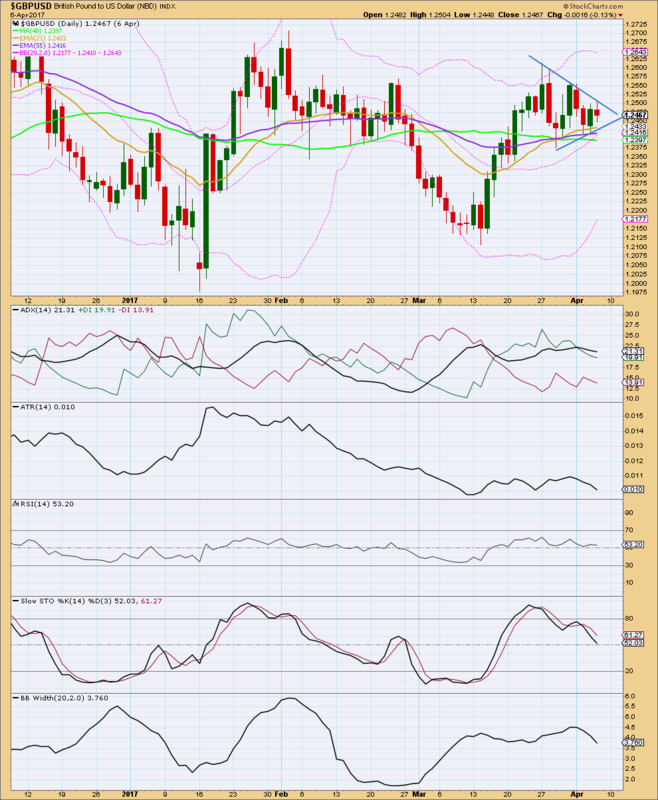 ADX is still below 15 and does not yet indicate a new trend. Bollinger Band expansion indicates volatility returning after the consolidation; with price moving lower as Bollinger Bands expand, this is bearish. ATR may be expected to begin to increase after a period of a small range. Stochastics is not yet oversold. This may remain extreme for long periods of time during a trending market. Only when it has been extreme for some time and then exhibits divergence with price while extreme should it be read as a strong warning sign of an impending trend change. That is not the case yet. Copper has found very strong resistance at the green trend line, which goes back to at least August 2011. The doji candlestick for February puts the trend from up to neutral. The upper edge of the blue channel has still provided resistance, with a strong overshoot for the 30th of March. 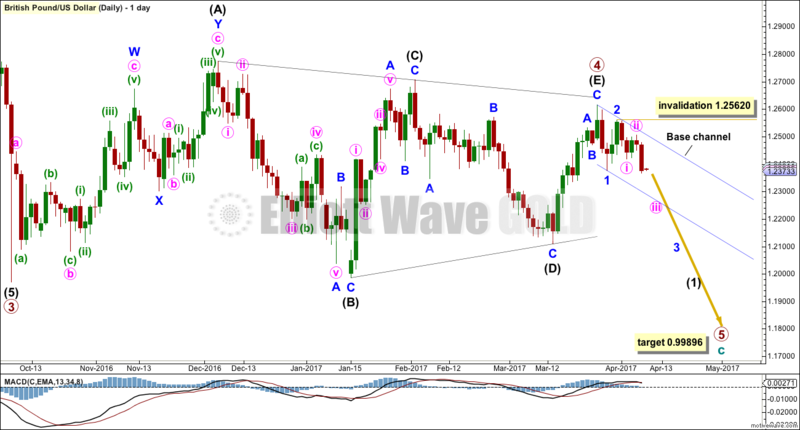 Copper may in the early stages of a third wave at three degrees now and this should see an increase in downwards momentum. The red daily candlestick of the 12th of April completes a Bearish Engulfing Candlestick pattern. 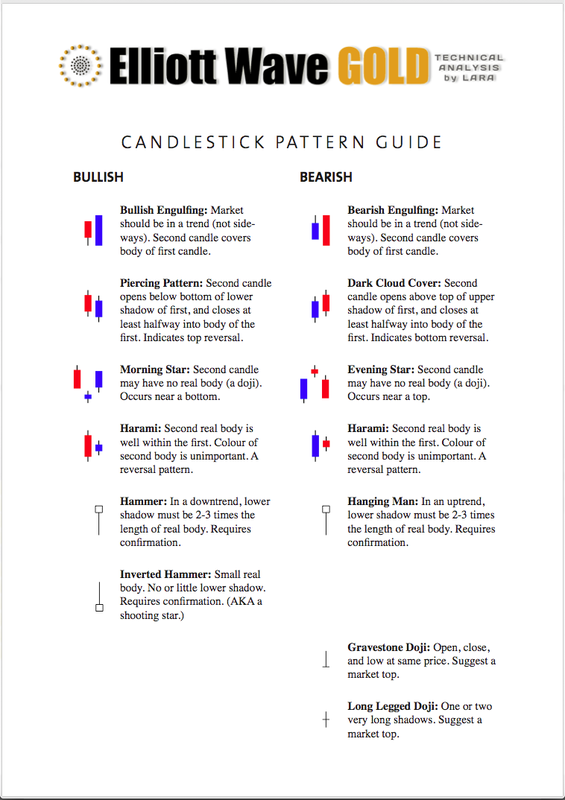 This is the most reliable of candlestick reversal patterns when it comes after an upwards trend. It doesn’t always work (it didn’t work on the 3rd of April), but it works more often than not. It is supported by volume. The last upwards day for the 13th of April did not have support from volume. This is also bearish. Overall, this chart is more bullish than bearish. Members were advised that I entered short Oil on the 12th of April. At this stage, this position is now positive. The basis for entering short was price breaking below the lower edge of the small gold channel that contains the upwards wave labelled minuette wave (ii). Now price may be beginning to move down and away. The prior pennant pattern is no longer correct. 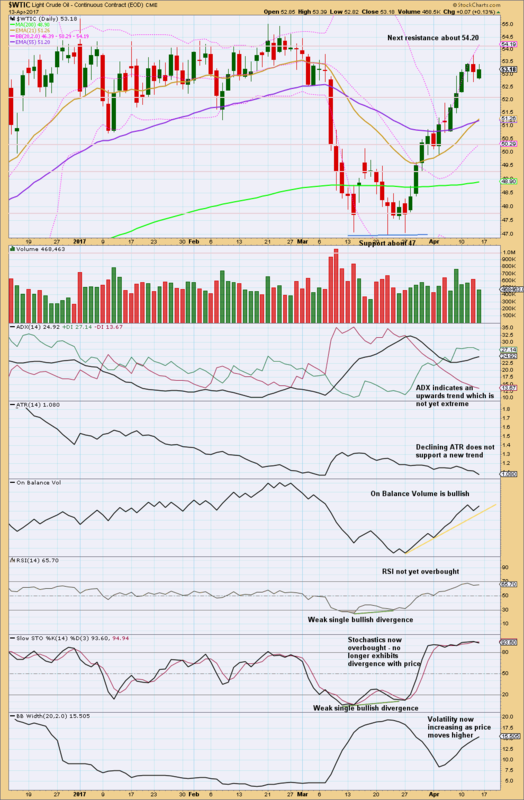 The last daily candlestick for the 13th of April is bearish and has support from volume. 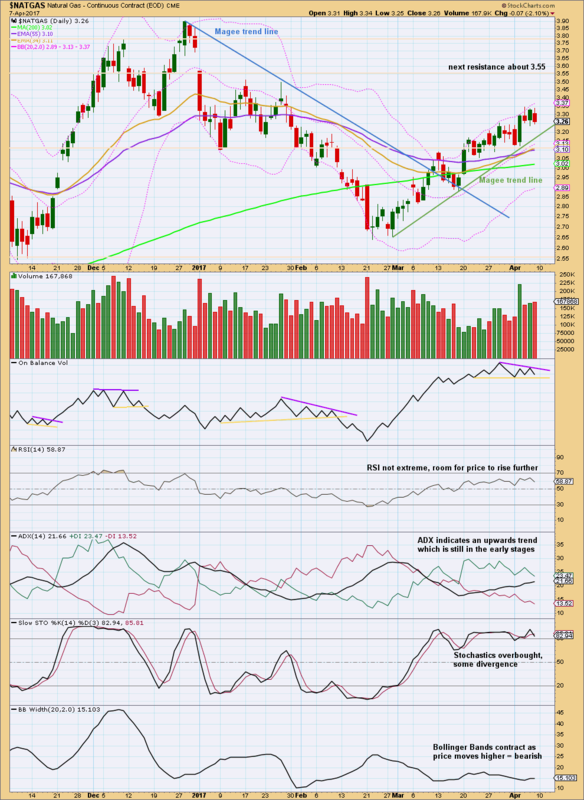 ATR and Bollinger Bands show there is something wrong with this upwards trend due to a lack of range and volatility. This trend is relatively weak at this stage. 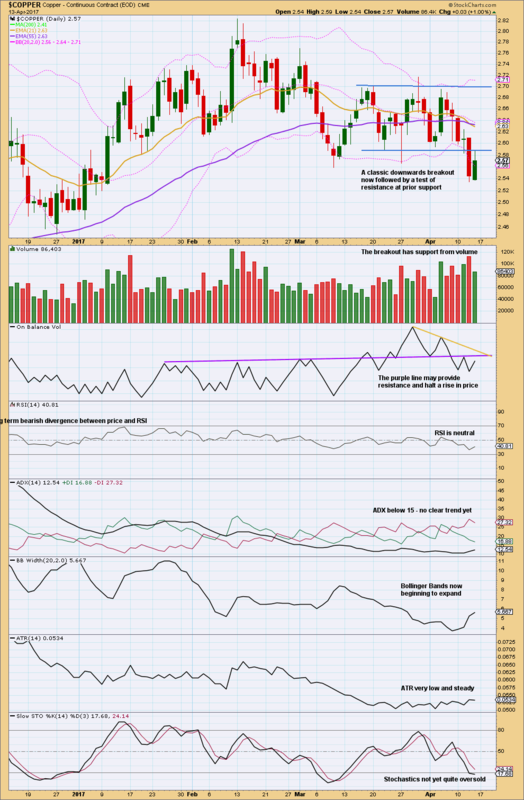 The bearish signal given in last analysis for On Balance Volume was negated. The support line is redrawn. On Balance Volume is constrained, giving no signal today. 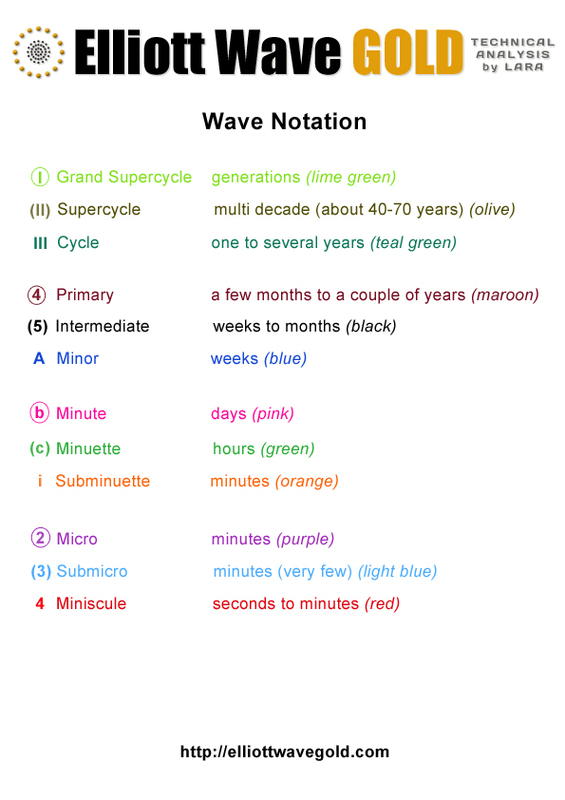 Cycle wave c needs to complete as a five wave structure. The final fifth wave is incomplete and may only have just begun. The target expects to see the most likely Fibonacci ratio between primary waves 5 and 1. Primary wave 4 fits perfectly as a regular contracting triangle, offering perfect alternation with the zigzag of primary wave 2. Primary wave 2 lasted 2 months and primary wave 4 lasted 6 months. Triangles are usually longer lasting structures than zigzags, so this disproportion is not only acceptable but should be expected. This wave count has the right look. 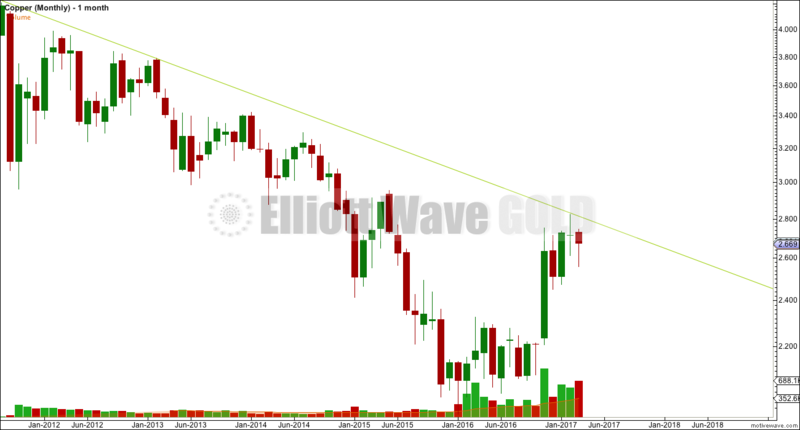 The breakout from the triangle should be down. Minor wave 2 moved higher and fits perfectly as an expanded flat correction. These are very common structures. The choice to try another short position here is based heavily on the three wave structure of minute wave b; with a three down following minor wave 1, only an expanded flat following an impulse will fit. 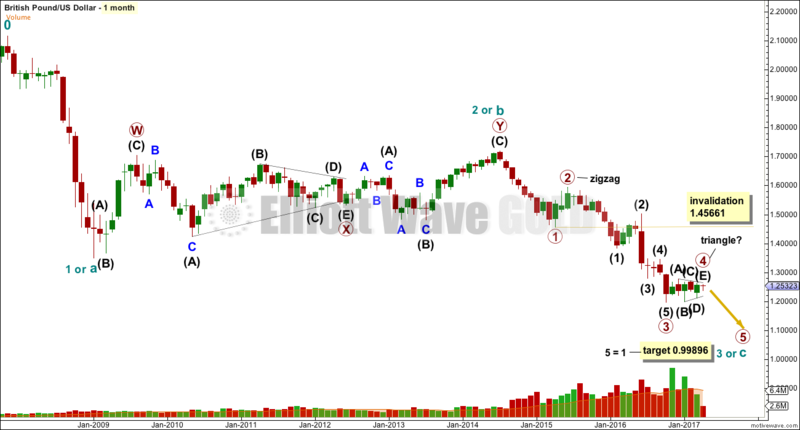 The trend should therefore be down if this Elliott wave analysis is correct. Minor wave 2 may not move beyond the start of minor wave 1 above 1.26157. 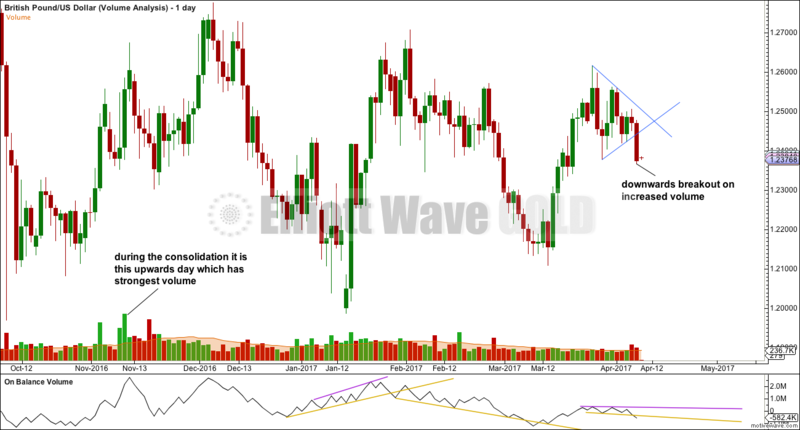 Trading advice for gold given to Elliott Wave Gold members will be included in Trading Room summary tables. 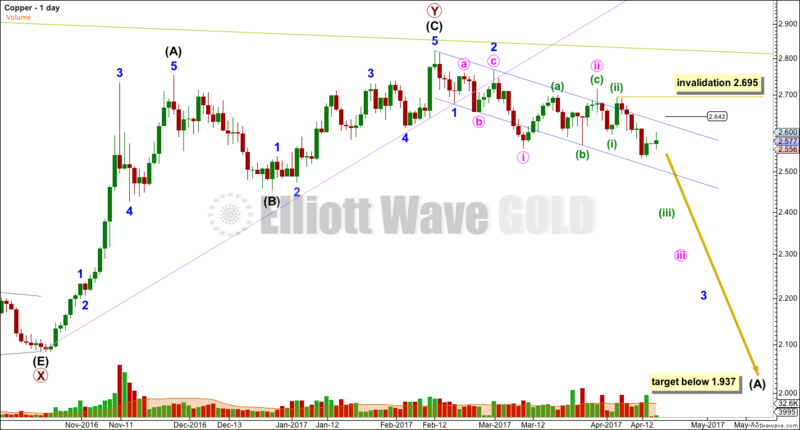 However, so that it remains private for Elliott Wave Gold members only, it will not be included in Trading Room posts. Each month a new “closed positions” table will begin. To see all closed positions for March 2017 see the last Trading Room post for March here. Accept that this analysis may be wrong. It is impossible for any analyst to predict with certainty what a market will do next. Members will be updated with trading advice over the next week here in comments for Trading Room. Comments are therefore private, for members only. This analysis is published @ 03:39 a.m. EST. Today’s Trading Room looks at Copper, Natural Gas and GBPUSD. 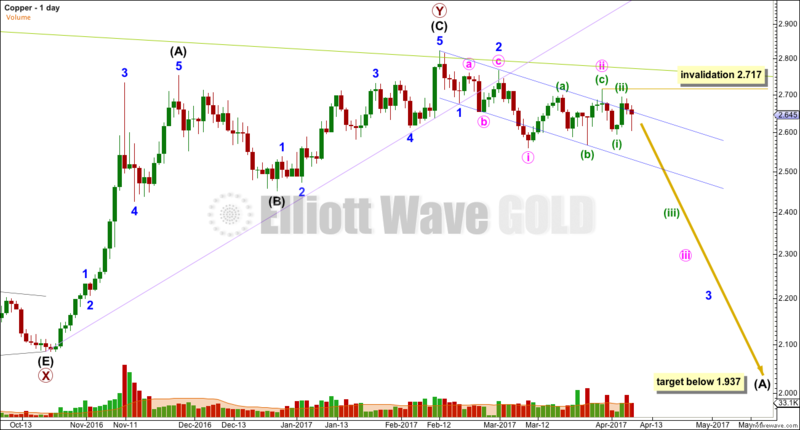 Last Trading Room advice to Elliott Wave Gold members advised to enter short with a stop just above 2.717. Members were advised that short positions should become profitable within 24 hours, which is what happened, and that stops should have been then moved to breakeven. The whipsaw of the 5th of April should have closed short positions for no loss. Copper is now range bound with resistance about 2.70 and support about 2.59 (with overshoots). Volatility declines as price moves sideways, ATR remains very low and flat, and ADX indicates a consolidating market. In the short term, the very long lower wick for the candlestick of the 7th of April indicates upwards movement is likely to begin the new trading week. The upper edge of the blue channel has provided resistance, with a strong overshoot for the 30th of March. Copper may be ready to move lower in a third wave at three degrees now and this should see an increase in downwards momentum. The Magee trend line was touched again on the 4th of April. This was the signal to enter long according to trading advice given. That best case entry point would have been at the low of the day at 3.122, but in reality members may not have entered exactly at the price point where price touched the line. However, any long positions should now be profitable and stops may be moved up to protect a little profit. The Magee trend line may be used now as a trailing stop for long positions. ADX indicates an upwards trend and RSI allows further room for price to rise. Stochastics is overbought and exhibits divergence with price, but this oscillator may remain extreme for long periods of time when this market trends. The bottom line is any pullbacks may be expected to find support at the green Magee trend line. On Balance Volume is now bound within a small range. Watch this carefully; if it breaks below the yellow support line, it would indicate a deeper pullback may be underway; if it breaks above the purple resistance line, it would indicate an increase in upwards momentum. 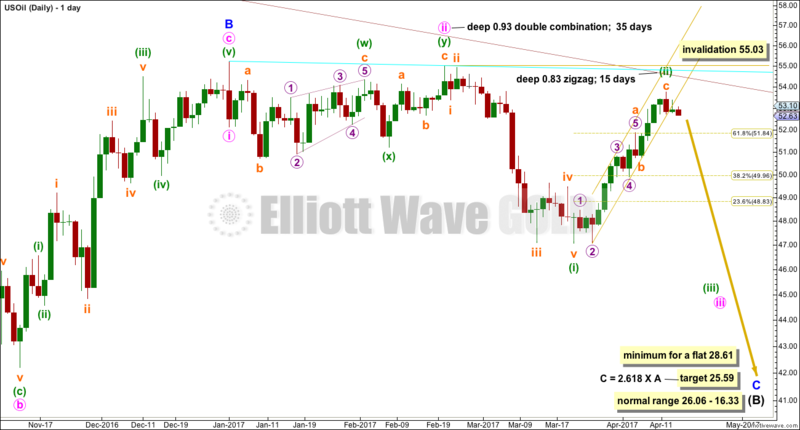 The last Elliott wave count was invalidated with a new high this week above 3.174. 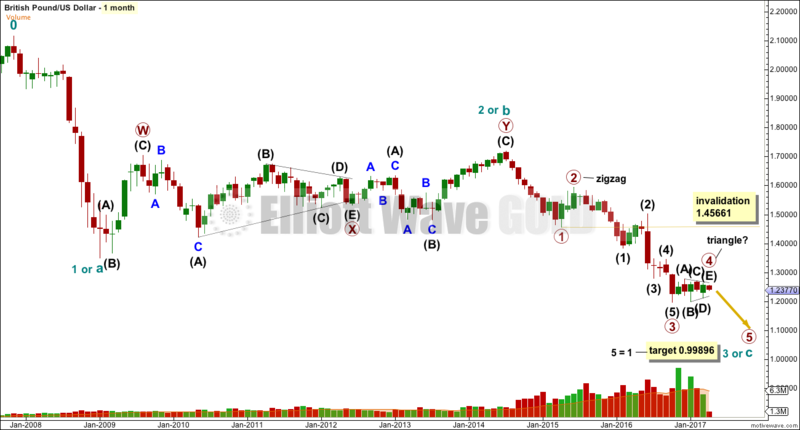 Cycle wave b may be continuing higher as a double zigzag. MACD indicates an increase in momentum to support this third wave up. When minor wave 3 is complete, then minor wave 4 may not move into minor wave 1 price territory below 3.088. The gold channel’s lower edge is the same as the green Magee trend line on the daily technical analysis chart. Price should continue to find support at the lower edge while minor wave 3 continues. Price looked like it was forming a Pennant pattern. What StockCharts data does not show today is the daily candlestick for the 7th of April that broke out of the pattern to the downside. The candlestick is shown today on FXCM data below. 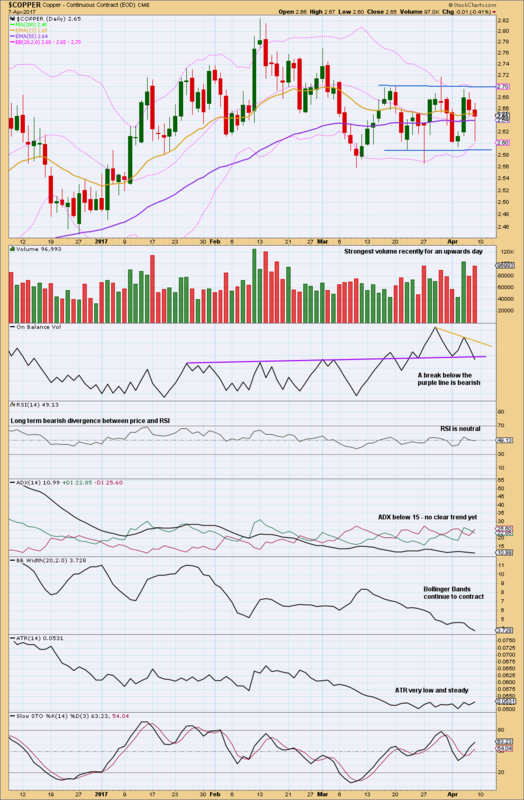 On Balance Volume gives a bearish signal with a break below the short term yellow support line. The downwards breakout from the pennant pattern has support from volume for a strong downwards day. 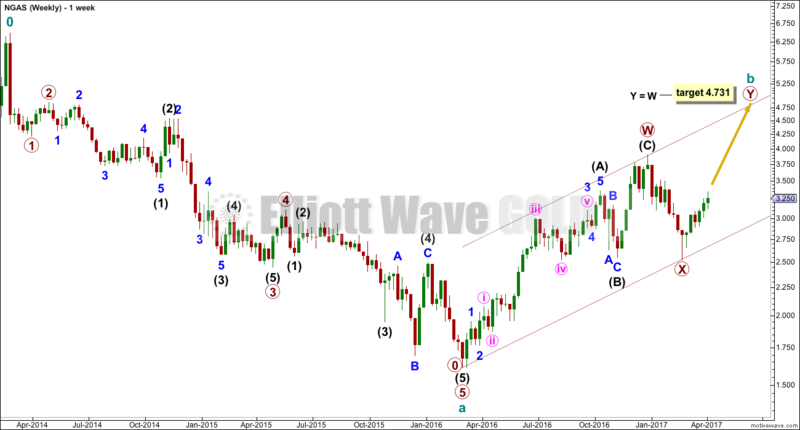 Within minor wave 3, no second wave correction may move beyond the start of its first wave above 1.25620. This analysis is published @ 06:48 p.m. EST.